Argus Heating design, manufacture and distribute a range of ceramic band heaters, including the Hotwatt and Tempco brands. These are high quality heaters and are ideally suited to the high melt temperatures required by many engineering resins. If you don’t want a new heater, a full repair or re-build service is offered on ceramic band heaters, avoiding the expense of purchasing new heaters. ‍High watt-density (up to 8.5W/cm²) and high temperature operation up to 760°C. Conserves energy, reduces heat loss and operating costs. 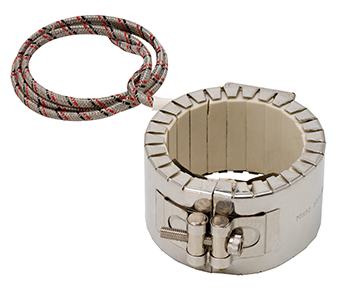 ‍Helically wound nickel chromium element spirals fitted into interlocking ceramic insulating bricks to form a flexible heating mat held in place by a stainless steel outer shell. Bands can be fitted with a layer of ceramic fibre insulation between the bricks and the outer casing, reducing power consumption up to 35%. These high quality ceramic band heaters are ideally suited to the high melt temperatures required by many engineering resins. Repair and rebuild is also available.